The Skinny: Entertaining but tragically silly action/comedy from Wong Jing that features Jet Li as the straight man to Jacky Cheung's hilarious Jackie Chan parody. 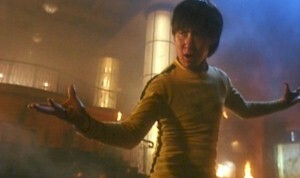 by Kozo: Jet Li is Kit, an ex-soldier who watched his wife and child get killed by a mad bomber. Years later, he becomes the bodyguard/stunt double for megastar actor/stuntman Frankie (Jacky Cheung). Frankie is actually a thinly-veiled Jackie Chan parody, and he's got all the telling signs: a silly grin, an extensive stunt team and entourage, and a popular Japanese fan base. However, Wong Jing's version of Jackie Chan is also a total coward who's forgotten his kung-fu after years of hard partying and making movies. Things reach a head when Frankie’s party is crashed by terrorists. And, among those terrorists is (duh!) the mad bomber that killed Kit’s family. Then the film becomes the HK equivalent of Die Hard as Kit and Frankie must subdue the terrorists. However, this involves Frankie remembering how to fight once more, which is tougher than it seems. Notes:  In 2001, High Risk was re-titled as Meltdown and released domestically by Columbia/Tristar Home Video.